Orijinal Ref. Number : 80670JD00E&80671JD00E. NISSAN QASHQAI. PAIR INNER DOOR HANDLE ( front or rear ). 1 X LEFT SIDE & 1 RIGHT SIDE. PRICE FOR PAIR. Orijinal Part Ref. Number : 8200283010 91168527 90610-00QAE 4414506 93851815 8200283010 91168527 90610-00QAE 4414506 93851815. NISSAN PRIMASTAR. REAR TAILGATE BACK SIDEOUTER DOOR HANDLE. R56 : "Mk II" Mini Hatch/Hardtop range (2006–2013). R53 : "Mk I" Mini Cooper S (2001–2006). R55 : "Mk II" Mini Clubman (2007–2014) --No rear cargo door handle covers available. R52 : "Mk I" Mini Convertible (2004–2008). • Carefully position the door guard and stick them onto door panel. • Clean (with alcohol if necessary) and dry surface for door guard to stick properly. • Use a heat gun and blow on the door panel surface where the door guard will mount. Fits all Mk3, Mk3.5 & 3.75 MX5 models, 2005>2015. We source our products from all over the world to bring you the best in MX-5 parts and accessories. Mk3/3.5 2005>2015. New to us, these are a lovely, easy to fit, six piece satin finish kit for the outer door handles. SLK Class R170 1996-2004. Protect the paint in the door handle pocket against scratches. It's a great way to keep the painted area behind the door handles from getting scuffed. You will receive 2x pieces of exterior door handle shells. VW Golf MK1 1 Cabrio Badgeless Debadged Front Grill Eyelid Trim Spoiler Eye Brow. 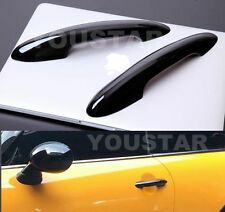 VW Golf MK1 1 Cabrio Rabbit Headlight Bonnet Trim Grill Spoiler Eyelid Eye Brow. VW Golf MK1 1 Badgeless Debadged GTI Grill Cabriolet Front Sport w/o Emblem BLK. 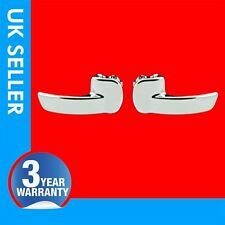 VW Golf MK1 1 Cabrio Rabbit Headlight Bonnet Trim Grill Spoiler Eyelid Eye Brow. VW Golf MK2 2 Badgeless Debadged Front Grill Eyelid Spoiler Eye Brow Headlight. VW Golf MK1 1 Badgeless Debadged GTI Grill Cabriolet Front Sport w/o Emblem BLK. XK, XK8, XKR. For Jaguar XK from 2006 to 2015. XK (Type X150) from 2006 to 2015. They will dress up, enhance and set your Jaguar apart from all the others! 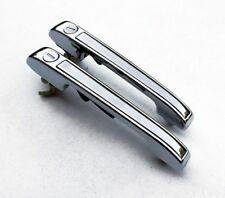 You will receive 2x pieces of exterior door handle shells. VW Crafter – 2006 Onwards. Wing Mirrors. Has 3M Double sided tape – ready to fit. Body & Misc. Add to Favorites. Set Of 4 (4 Doors). Will Fit the Following. PRODUCT INFORMATION. Both the left and right side Door Scoup trims. Remove protective film from adhesive, press firmly to insure proper adhesion. Complete trim set available - for Mirrors / H ead & Rear lights. Procedures 1. W219 CLS Class 2005-2011. Protect the paint in the door handle pocket against scratches. It's a great way to keep the painted area behind the door handles from getting scuffed. You will receive 4x pieces of exterior door handle shells. Will fit all T5 T5.1 T6. For VW T5 Transporter Gloss Black Handles Set Of 3. This is a great way to update the look of your vehicle from the old dull grey original door handles to superb looking gloss black covers. DIRECT TO YOUR CAR. We specialize in car parts. C209 / A209 CLK Class 2003-2009. Coupe and Convertible. The best quality jewellery grade mirror finish on the market. Protect the paint in the door handle pocket against scratches. Just Peel and Stick in minutes,No cutting or drilling required. We source our products from all over the world to bring you the best in MX-5 parts and accessories. Fits all Mk3, 3.5 & 3.75 models, 2005>2015 with an airbag steering wheel. Mk3/3.5 2005>2015. Mk2/2.5 1998>2005. F56 : MINI Cooper 3-door hatchback 2014 on. F57 : MINI Cooper Convertible 2016 on. Gloss Black Exterior Door Handle Covers. Item includes : Set of 2x Gloss Black Door Handle Cover Trims. 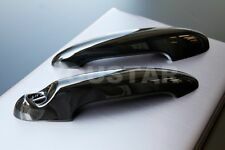 Give your MINI an upgraded appearance by highlighting the door handles with these YOUSTAR Gloss Black Door Handle Covers that add a unique accent. R58 : Coupé (2011–2015). R57 : "Mk II" Mini Convertible (2009–2015). R56 : "Mk II" Mini Hatch/Hardtop range (2006–2013). R53 : "Mk I" Mini Cooper S (2001–2006). R55 : "Mk II" Mini Clubman (2007–2014). Both the left and right side Inner Door Scoup trims. Complete trim set available - for Mirrors / H ead & Rear lights. Procedures 1. Insure the surface is clean, dry and free for all wax, grease and oil. 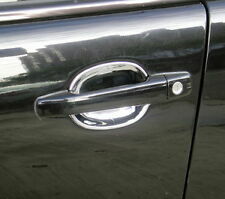 Satin Chrome Door Handle Covers Enhance the look of your car by fitting these stylish door handle covers. Made from highest quality materials that will last and stand up to the British weather, including genuine 3M tape to ensure they stay stuck well. Avoid any nasty surprises & buy in confidence from a UK Ltd company with UK stock ready for immediate dispatch! The price shown includes VAT & an itemised invoice is automatically included with all purchases Suitable For: RR Sport (10-13) Suitable For: Discovery 4 Suitable For: Freelander 2 (2010 ) Colour: Satin Chrome Condition: Brand New Warranty: 12 Months Contains: 4 x Handle & lock covers . Trim Cover 2 Keyhole for Hyundai 07 H-1 iLoad. Fit with 07 08 09 10 11 12 13 14 Hyundai iLoad. 2 Keyhole(Driver Passenger Side) - Front Door Handle Keyhole Type. Fit with 07 08 09 10 11 12 13 14 Hyundai iMax. • Jaguar part number:C2D26987LML. This will fit Jaguar XJ. This is not an after market product all our products are genuine. All our products are genuine. R56 : “Mk II” Mini Hatch/Hardtop range (2006–2013). Mini Bitz Door. R53 : “Mk I” Mini Cooper S (2001–2006). R55 : “Mk II” Mini Clubman (2007–2014) —No rear cargo door handle covers available. R52 : “Mk I” Mini Convertible (2004–2008). Our 45 years in the industry has also seen us develop a close affiliation with various manufacturers and stakeholders in Thailand for which we are able to utilize and source out the best possible price for your desired product anywhere in Thailand and distribute worldwide. Fit For Benz E Class W212 2009-2015. FOR Land Rover. Material:Made Of High Quality ABS Plastic. Easy Installation, 3M automotive adhesive tape is attached. If our product doesn’t fit to your vehicle or you are unsatisfied with any aspect of our service. LADA 4 x 4 vehicle: all LADA 4 x 4 1.7 i M. LADA: LADA 21214 4 x 4 1.7 i. LADA Niva Taiga 4 X 4 sill pad black left right lettering gold mounting screws. Vehicle 2: Lada Niva all models. Vehicle Niva / Taiga: Lada Niva all / Taiga. 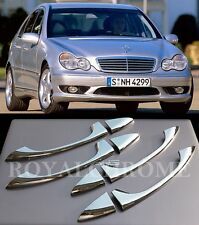 Shiny Chrome Door Handle Covers Enhance the look of your car by fitting these stylish door handle covers. Made from highest quality materials that will last and stand up to the British weather, including genuine 3M tape to ensure they stay stuck well. Avoid any nasty surprises buy in confidence from a UK Ltd company with UK stock ready for immediate dispatch! The price shown includes VAT an itemised invoice is automatically included with all purchases Suitable For: RR Sport (10-13) Suitable For: Discovery 4 Suitable For: Freelander 2 (2010 ) Colour: Chrome Condition: Brand New Warranty: 12 Months Contains: 4 x Handle lock covers. Toyota Hilux Revo Rocco SR5 2015 - 2019. 2015 - 2019. Black Carbon. Technical Skill Level. Number of Item(s). We are hereby to resolve any problem you may have. Car modelFor Jaguar XE/XF 2016 2017 2018 2019. Surface FinishABS carbon fiber. Manufacturer Part NumberKadore130191. All our products are not suitable for the car, which is. Suzuki New Swift Hatchback 2018 - 2020. 2018 - 2020. Carbon Black. Technical Skill Level. Number of Item(s). We are hereby to resolve any problem you may have. Toyota Innova SUV 2018-2019. Black, Red. Technical Skill Level. Number of Item(s). We are hereby to resolve any problem you may have. Toyota Hilux Revo ; 2015 - 2017. 2015 - 2017. Technical Skill Level. Number of Item(s). We are hereby to resolve any problem you may have. 2 Doors 4 Doors. FIAT DOBLO MK1. REAR TAILGATE DOOR HANDLE. Part Ref.Number : 735331105N. Isuzu D-Max 2012 - 2018. Technical Skill Level. 2012 - 2018. Number of Item(s). We are hereby to resolve any problem you may have. New Mini F56 F57 Comfort Access Handle covers in black gloss for Left hand drive Mini's. Comfort access holes for keyless entry system on both sides. Easily reversed if ever wanting to change back. R60 : MINI Countryman 1st Generation (2010–2016). It willNOT fit to the 2nd generation Countryman F60 2017 onwards-- Also listed. Gloss Black Exterior Door Handle Covers. Item includes : Set of 4x Gloss Black Door Handle Cover Trims. (Material: 3K twill weave real carbon fiber. 3)Remove the tape cover and place the product at the exact position, press it to make a good adhesive;. To make your car more stereoscopic sense, more eye-catching, and get unique charm. Update the aesthetic of your Range Rover L322 with carbon fibre style door handle kit, perfect for a adding sleek, modern finish. Suitable for Range Rover L322 models. Carbon Fibre Effect Door Handle Kit. Handles casings are weather resistant so that their usefulness significantly extended. Chroma assembled on degreased surface by peeling off the cover foil strip assembly, which is located on the inner side of our overlay. Chevrolet Colorado ; 2016 - 2018. 2016 - 2018. Technical Skill Level. Number of Item(s). We are hereby to resolve any problem you may have. Cover for 04-08 Chevrolet Lacetti Optra. Fit with 04 05 06 07 08 Chevrolet Lacetti - 4 Door Sedan, 5 Door Hatchback, 5 Door Wagon. Fit with 04 05 06 07 08 Daewoo Lacetti - 4 Door Sedan, 5 Door Hatchback, 5 Door Wagon. F56 : MINI Cooper 3DR hatchback 2014 on. F57 : MINI Cooper Convertible 2016 on. Item includes : Set of 2x Gloss Black Door Handle Recess Inserts. Gloss Black Door Handle Bucket Covers. Give your Mini an upgraded appearance by highlighting the door handles with these YOUSTAR Gloss Black Door Handle Bucket Covers that add a unique accent.